Water is essential to life in the desert, and as the population of non-miners grew, locals began thinking of diversifying into agriculture to keep the area alive. In anticipation, they began a program to carry water from the Mojave River toward Daggett through a dam and ditch system. Today the Daggett Ditch, also known as the Minneola Canal, is one of the oldest historic irrigation projects on the Mojave River. The Mojave River is largely an underground waterway, with water flowing beneath the sand and rarely visible at the Surface; it is sometimes referred to as the “Upside-Down River.” In 1893, a company was formed to try to build a submerged dam that would impound and then divert water into an irrigation ditch. Stock for the new company was issued, on the premise that water would generate electricity to sell to the mines and mills at Calico and pay for the ditch, thereby providing the farmers and citizens of Daggett with a free supply of water. Homesteading claims for over 1,800 acres of land were filed with the federal government in anticipation of the new water system. Even though the dam was built, the project failed, creating less than three percent of what was needed to realize those high hopes. In 1901, four individuals, including Theodore Strong Van Dyke and his son Dix Van Dyke, formed a new company and started to improve the old dam and line the old Daggett Ditch. Through their efforts, they were able to bring irrigation to 320 acres of new farm land east of Daggett (including the Van Dykes’ ranch) by 1902. This was the first large area to be irrigated in the Mojave Desert. The dam was located in the Mojave River northeast of the Marine Corps Logistics Base today. The earthen ditch delivered water ten miles from the dam and its as-sociated artesian wells to irrigate orchards and alfalfa fields in the six miles between Minneola and Daggett. With the addition of water, the Van Dyke ranch became the first place in California after leaving the Colorado River to find hay and alfalfa for teams of horses and a popular stop for travelers. 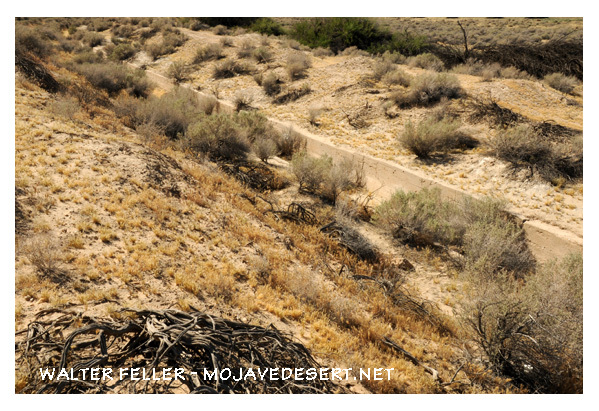 By Cindy Baker - PAR Environmental Services, Inc.
An irrigation ditch that was started in 1902 and ran from the Mojave River 4 miles upstream of the Van Dyke Ranch to Daggett and was used to irrigate crops. It ran along the south side of the river and passed through Daggett before reaching the Van Dyke Ranch. There were fish in it in the 1950s and it was still in use into the 1970s. Also known as Mineola Canal and the Wind and Water ditch.